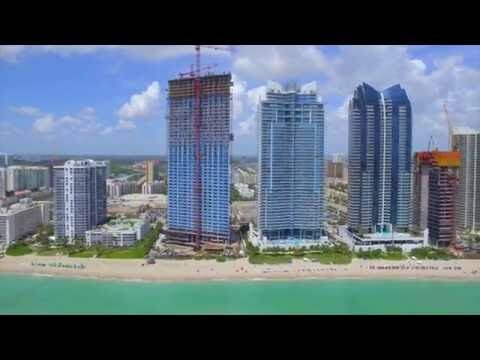 Jade Signature is an ultra-luxury condo development located in Sunny Isles Beach. Built in 2018, Jade Signature was developed by Fortune International Group and designed by Pritzker Prize-winning Swiss architecture firm Herzog & de Meuron. The interiors and common area spaces at Jade Signature were designed by French master of luxury interiors Pierre-Yves Rochon of PYR with exterior landscaping designed by Raymond Jungles, Inc. Rising 57 floors, Jade Signature has 192 condo residences comprised of one-, two-, three-, four-, and five-bedroom options plus penthouses, ranging in size from 1,378 to 11,661 interior square feet plus terrace. The units at Jade Signature include views of the Atlantic Ocean, Intracoastal Waterway, and Miami skyline. Jade Signature offers its residents a laundry list of world-class amenities, including a zero-entry swimming pool; poolside cabanas; hot tub; bar and grill restaurant offering service to the pool and beach; children’s playroom with video games and smart board; toddler sensory and reading center; teens’ tech lounge; 25-meter lap pool on south of the tower offering maximum sun exposure; entertainment lounge with billiards, poker table, and backgammon; wine bar; health and wellness center with sauna and steam room, co-ed hammam, full-service spa, manicure/pedicure lounge, treatment rooms, state-of-the-art fitness center, spin studio, men’s and women’s locker rooms, private Pilates studio, and cold-press juice bar; library; reading lounge; business center with conference room and private office, and more. Additionally, Jade Signature condominiums offers full-service concierge, 24-hour valet parking, electric-car charging service, and high-speed elevators. Jade Signature condominiums is located at 16901 Collins Avenue, Sunny Isles Beach, Florida 33160. Its location places you in the heart of America’s Riviera and within 30 minutes from two international airports, an executive airport, Aventura Mall, and South Beach. Within walking distance of Jade Signature Sunny Isles Beach are a number of shops, cafes, and parks. What year was Jade Signature completed? Jade Signature was completed in 2018. How many units does Jade Signature have? Jade Signature has 192 condo residences. What is the address for Jade Signature? Jade Signature's address is 16901 Collins Ave, Sunny Isles Beach, FL 33160.